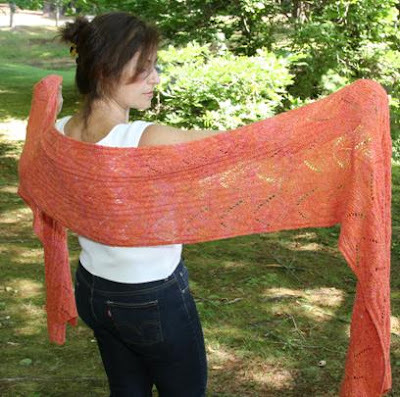 The Sunshine Wrap by Tonia Barry! Pattern designer Tonia Barry of http://www.toniabarryoriginaldesigns.com/ put together this fabulous pattern using our Rondure Silk Boucle yarn, in colorway "Poppies". Ivy Brambles Rondure Silk Boucle is an exciting, pretty, fun, new, stunning hand painted Boucle! Need we say more? 100% pure silk, 310 yards, 3.5 ozs per skein, and 100% luxury! This yarn is available at the Yarn and Fiber Company in Derry, NH. The ramblings and happenings, new patterns and hand dyed yarns from the folk at Ivy Brambles.